Since the launch of this website, I have been contemplating what to write for the first “official” blog post. Should I talk about my intention (future) or the path that led me here (past) or the present? While thinking, I asked myself – What kind of tone do I want to set? I remember someone telling me setting the “right” tone is very important. However, once the tone is set and the audience is found – how much deviation or evolution can be had afterwards? This reminds me of friendships and relationships. True friendships and relationships grow and evolve with me. They do not hold me back in any way, shape or form. 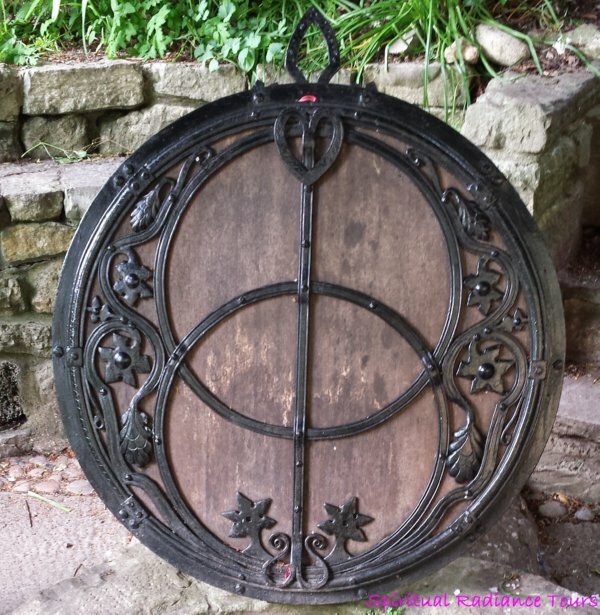 The Mandorla which covers the Chalice well at Glastonbury, UK. In reality, what does it mean to define a tone? Is it perhaps my perfectionism trying to reign supreme? What happens if my perfectionism covers up my authenticity? Is my perfectionism actually ruled by social or societal expectations and my old tendency of seeking outward approval? You are probably thinking, who starts a blog post with so many questions. It’s as though I am talking out loud. Well this blog really is an expression of my thoughts. It is through my thoughts and personal experiences that have helped me arrive at this moment in my life. To the point where I want to lead others’ on their own private spiritual journey. It is my belief that – Curiosity and Inquiries lead to wisdom and experiences. I want to be comfortable with my own authenticity. When someone travels with me, we will interact on a daily basis and talk about matters of the heart, mind, body and spirit. There is no point for me to “sanitize” my thoughts. Just some minor curating so you can follow my train of thought. Likewise, I want you to be comfortable with owning your voice and thoughts. Honesty and Authenticity shall reign supreme at Spiritual Radiance Tours.